Manufactured and marketed by Bausch & Lomb, Inc., Rochester, New York, the Ray-Ban® Survivors® Collection sunglasses feature a technological advance that makes them 10 times more scratch-resistant than conventional glass lenses. Ray-Ban Survivors Collection sunglasses feature a coating that offers 10 times the scratch-resistance of conventional glass lenses. The DiamondHard® technology involves coating the lenses with a film of diamond-like carbon (DLC) that not only provides scratch-protection but additionally reduces surface friction, so that the lenses shed water more easily to reduce spotting. The film coatings are supplied by Diamonex Optical Products Group, Allentown, Pennsylvania, which employs a modified version of a dual ion beam bonding process originally developed by Lewis Research Center. The hardest substance known, diamond offers a wide range of potential applications but the potential was slow to develop because of the high cost. Interested in the possibilities of synthetic diamond coatings for aerospace systems, Lewis Research Center sought to get the advantages of diamond without the cost penalty by depositing a thin film of DLC on an inexpensive substrate (supporting material). Lewis conducted extensive research on the properties of DLC and ways to deposit the film on different types of substrates. Among the coating methods developed was a technique known as direct ion deposition, in which an ion generator creates a stream of ions from a hydrocarbon gas source; the carbon ions impinge directly on the target substrate and "grow" into a thin DLC film. Lewis patented the technology and subsequently licensed it to Air Products and Chemicals, Inc., Allentown, Pennsylvania, which was exploring aerospace applications of diamond coatings. An Air Products spinoff company-Diamonex-used the NASA technology along with its own proprietary technology in developing both polycrystalline diamond and DLC coatings for commercial optical products. 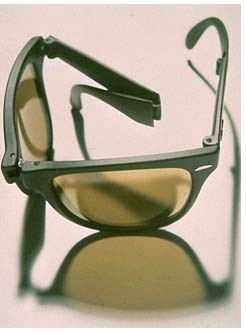 ®Ray-Ban, Survivors and DiamondHard are registered trademarks of Bausch & Lomb, Inc.